The phaseout of the traditional incandescent lightbulb to push energy efficiency in the U.S. has sent the lighting industry and retailers into overdrive to meet the requirements that take effect next January. Now toymaker Hasbro is hastening to redesign a childhood classic. The Easy-Bake Oven, which uses a 100-watt bulb as its heat source, is getting a makeover. Hasbro has already retooled its website to feature “Easy-Bake Microwave & Style” sets, a kit that can be used to make baked goods with fondant-style decorations in a microwave oven. Inducted into the National Toy Hall of Fame in 2006, the Easy-Bake Oven has frequently changed its look in the nearly half century since its debut in 1963, when the plaything was made by Kenner Products, now a division of Hasbro. 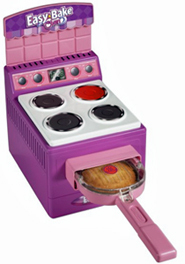 The original Easy-Bake looked like a pint-sized, four-burner range and oven. The most recent model is shown in Hasbro product photos above. Throughout the years, the oven’s operating principle hasn’t changed much. But starting in fall, the new model will feature “a heating element that does not use a lightbulb and offers an extensive assortment of mixes reflective of the hottest baking trends for today,” according to Hasbro’s statement. As GreenBiz.com readers know, lighting companies have introduced a host of new products in preparation for the rolling phaseout of incandescent bulbs, effective January 1, 2012. Under the Energy Independence and Security Act of 2007, 100-watt incandescent bulbs will be the first to go. Seventy-five-watt traditional bulbs follow in 2013 and sale of 40- and 60-watt bulbs are to end in 2014. Among retailers, IKEA began pulling incandescents from its shelves in August and with the new year declared that it no longer sells any incandescents, even though the first stage of the phaseout was a year away and applies only to 100-watt bulbs. With the retirement of the 100-watt lightbulb, the traditional Easy-Bake is destined to become a collector’s item, and those who have them in good working order will have to stockpile bulbs to keep using the toy. Top image and first inset photo from Hasbro. Inset photo of a 2006 model from the U.S. Consumer Product Safety Commission.